In lots of situations, meetings can be a waste of time Fed Up Of Inefficient Meetings? Send These 8 Rules To Your Boss Fed Up Of Inefficient Meetings? Send These 8 Rules To Your Boss If a meeting is well organised, there's no reason it can't enhance productivity, sense of purpose, and morale. Here are some rules to follow for effective meetings. Read More . Sometimes, it seems like the time spent in a meeting is just to avoid getting down dirty with the actual work These 10 Distractions Are Crushing Your Productivity These 10 Distractions Are Crushing Your Productivity No one can escape the distractions of doom! Read More . But that’s not always the case. Sometimes meetings are necessary 10 Tricks to Make You Seem Like The Smartest Person in a Meeting 10 Tricks to Make You Seem Like The Smartest Person in a Meeting Picture this, you walk into work one day, thinking everything is normal. Then your boss drops the ultimate bombshell on you: there's a meeting, and you had no idea it was coming. 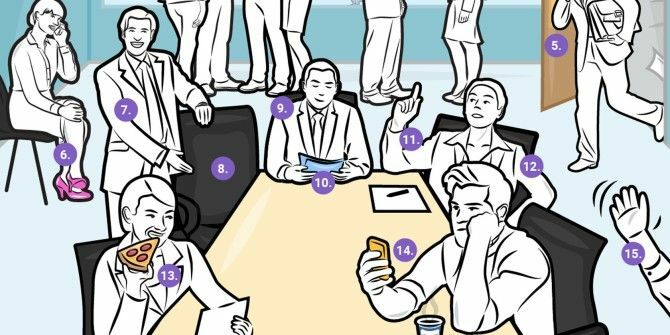 Read More , and if you’re not following the 15 meeting etiquette rules outlined on the Infographic below, you’re doing them wrong! Learn Pokemon Go Safety in 15 SecondsVideo Games Help You Live Out Your Dreams of… Working? Don't overdo meaningless clip-art filled powerpoints or worse, read them from the screen. Worse still, powerpoints with graphs or tables with lots of decimals (and read them one by one "efficiency is up 12.483%"). Corollary: Don't use un-copypasteable infographics either. Dave, do people still really meet in person nowadays? I'm always saying "the most efficient meeting is the one that is cancelled (not postponed)". Make your desicions thru email or group messaging, this way a written record is automatically generated instead o relying on someone transcribing minutes.